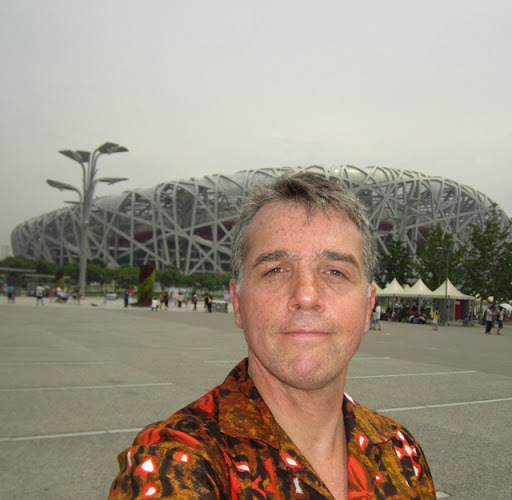 I travel frequently and one of my great laments is the way so many places around the world are focused on modern development at the expense of local heritage. 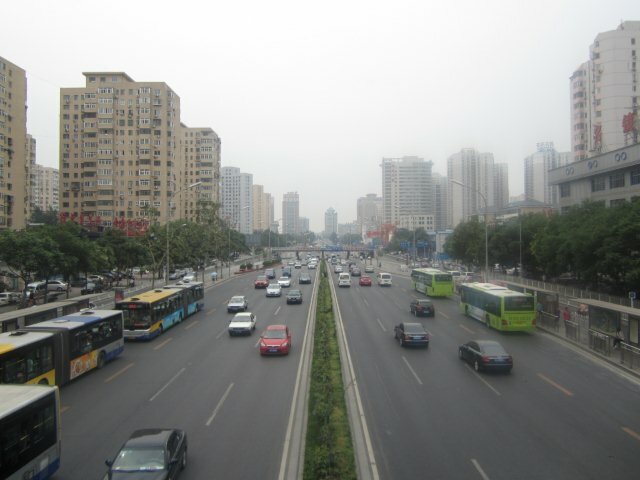 Here’s an example from Beijing. 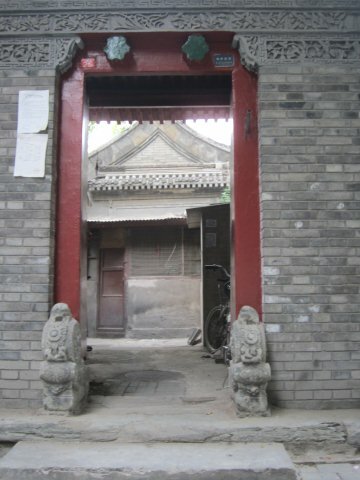 This is a traditional hutong or courtyard house I once lived in. 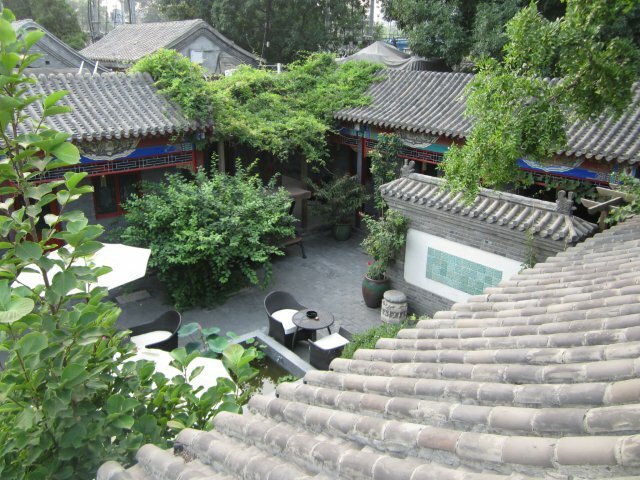 It’s 800 years old and has served as a private home, a hotel, a school, and a dozen other functions over the centuries. Dynasties rose and fell, China was colonized by the British, the Japanese invaded, communists seized power, capitalism re-emerged… and this building continued to serve people well no matter what. It has recently been given a face lift with money from a Taiwanese businesswoman who appreciates its historic character. It took an outsider to see its charms since the locals are all desperate to move into a modern high rise and buy a car. The property is now rented to foreigners looking for an authentic experience. My disappointment in the modern development pattern isn’t merely sentimental. Older places simply perform better and hold up over time. 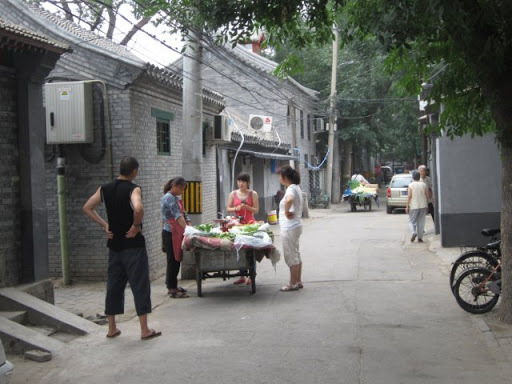 The traditional Chinese hutong is an excellent urban building type since it permits private secure outdoor space in a very densely populated setting. 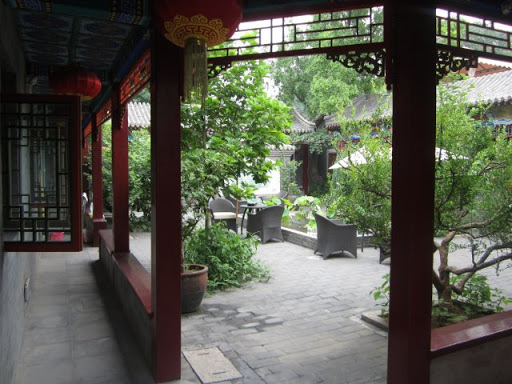 This home was built for a wealthy family so the courtyard is large and surrounded by many rooms (which is why it made a great school a few centuries ago) but even much poorer families in much smaller versions of the hutong still manage a couple of rooms and a small courtyard. The courtyards can be purely ornamental, but most often they’re functional spaces for cooking and home based craft businesses. Until recently homes were almost always productive enterprises as well as family housing. 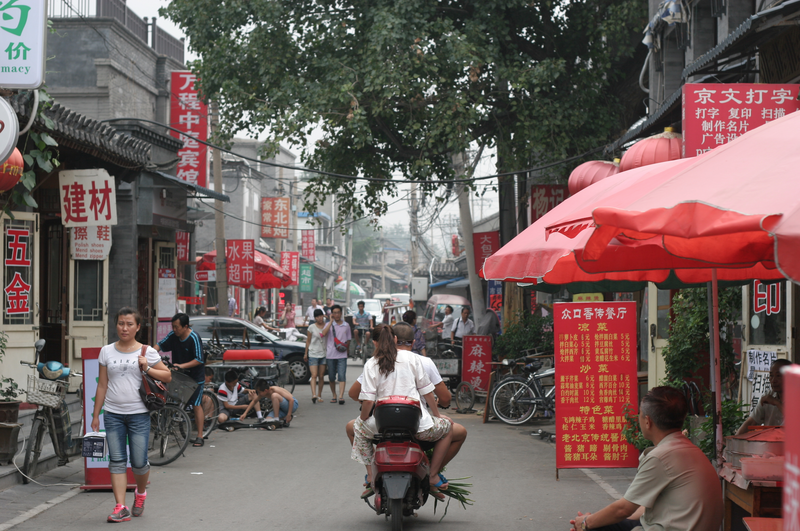 The hutongs are packed tightly together in a grid and organized along narrow pedestrian streets where vendors with pushcarts sell everything from fresh produce to hot noodle soup and brooms and baskets. 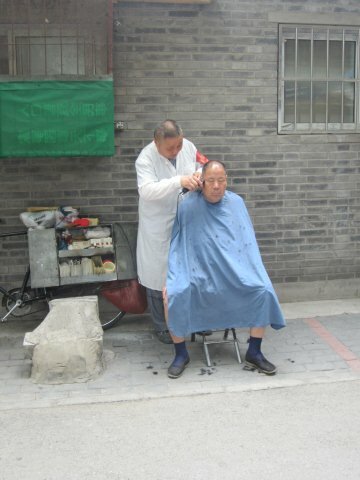 Old men play cards and dominos and people get their hair cut. It’s a peaceful quiet and convivial public realm. You can hear birds singing and children playing. 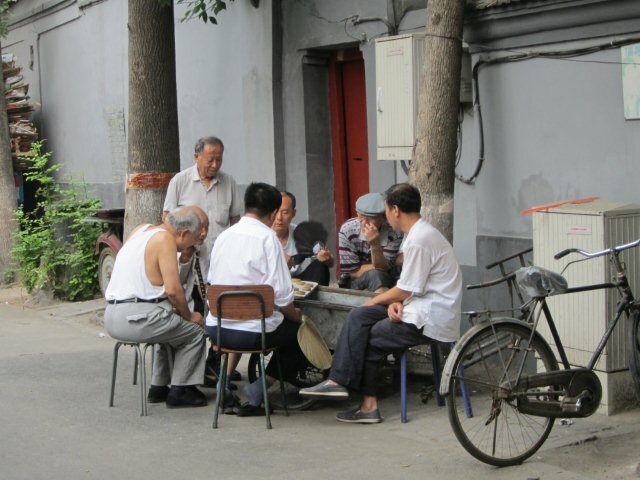 Old folks can shuffle along as they go about their business and greet neighbors. It’s a safe environment since there are plenty of “eyes on the street”. Cars can’t race down these narrow street (although they do try) since the physical limitations put a hard cap on speed. The narrow streets eventually open up to wider streets with more shops and activity, but it’s still a human centered environment. 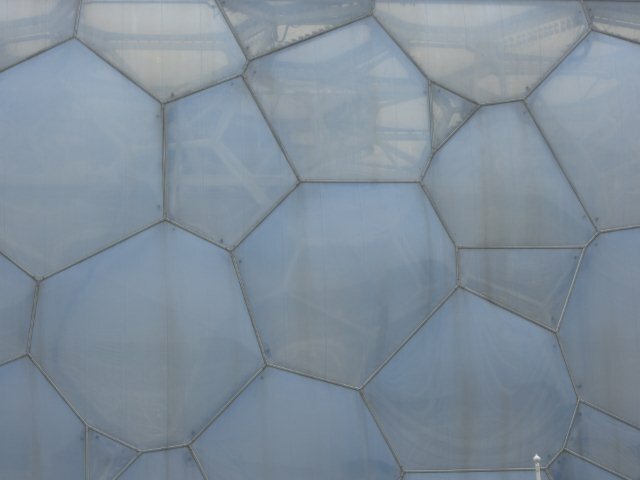 It also happens to be completely sustainable and highly efficient – otherwise it wouldn’t have lasted so long. 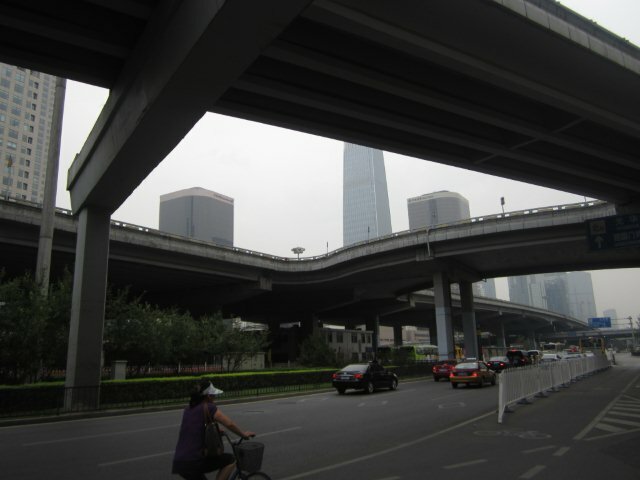 This is in sharp contrast to the new style of development that is rapidly erasing the old hutong neighborhoods in favor of massive highways surrounded by cheap poorly constructed apartment blocks for the fair-to-middling classes and starchitect monoliths of the new rich. I’m no luddite. I appreciate modernist architecture as much as the next person. I can also be won over by the sheer size and scope of an impressive building and grand public space. But context is important. 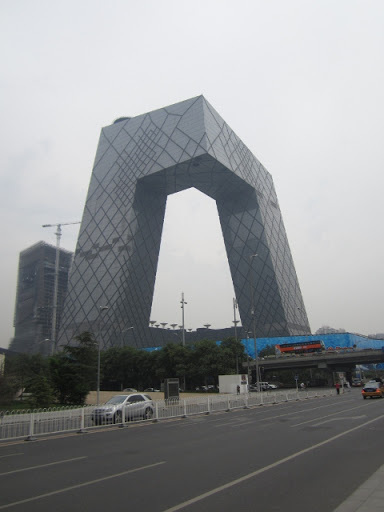 I was keen to visit the CCTV building by Rem Koolhaas. The building itself is a fun “perfume bottle”, but it’s encased inside a high security superblock surrounded by giant highways on each side. From the sidewalk pedestrians are faced with a massive perimeter wall with no opening of any kind. The building repels humans while the car and bus traffic makes the experience even more unpleasant. The building is closed to the public and the only way in or out is through underground tunnels for cars and subway passengers who have security clearance badges. Armed guards and security cameras are everywhere. I thought about the implications of this design for emergency fire egress – or the lack thereof. Time will tell on that one. In a way the CCTV building mirrors the hutong courtyard model of private interior space but on a scale that makes people feel like termites. I have a hard time imagining this building lasting for 800 years. Now picture mile after mile of these sealed up mega structures lining the highways. It’s a hideous place to be on foot. Cyclists (in spite of the bike lanes) are Frogger style road kill waiting to happen. This is complicated by the fact that people in cars almost always have infinitely more money than the people on the street and so far China hasn’t gotten around to liability laws or a court system that disciplines drivers in any way. Here’s another example of a relatively cool building that manages to be grand and beautiful yet inhuman in it’s proportions. 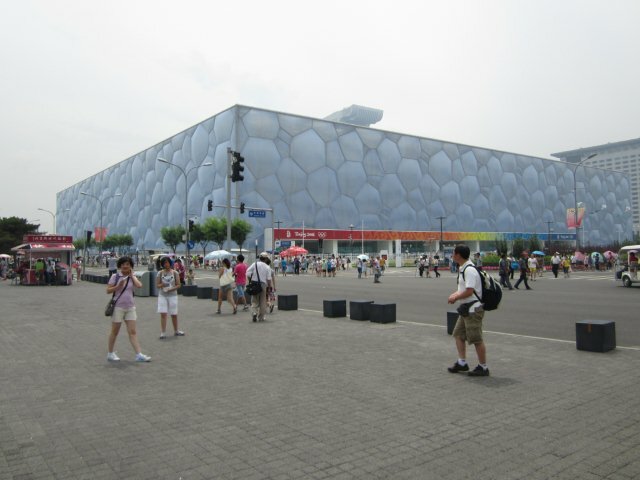 The Bird’s Nest stadium is an amazing work of engineering and design and was a prime venue during the Olympics. But it sits in the middle of about a zillion acres of pavement (pavement that used to be a thriving neighborhood) that is unbelievably hot in summer and a windswept tundra in winter. It physically dares humans to occupy the space. 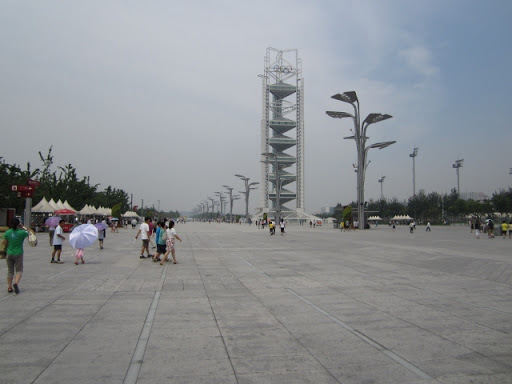 It reminds me of the state capital of New York in Albany where a traditional neighborhood was razed to the ground and replaced with giant slab towers on a vast lifeless concrete plaza. 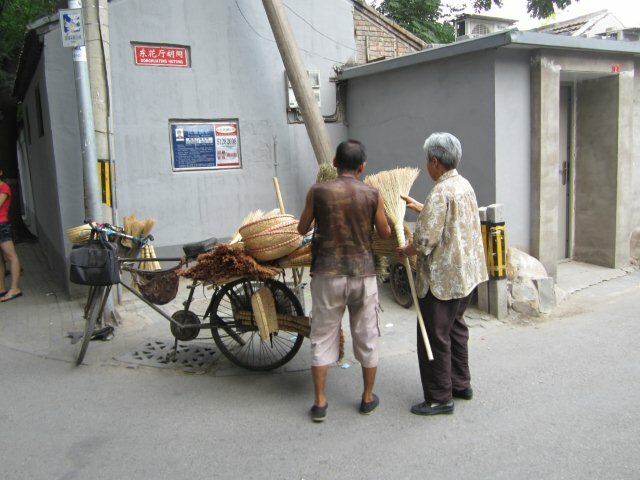 Similarly the hutongs of Beijing are intentionally being removed to make way for things like the Bird’s Nest. Notice the Godzilla size street lights. (I couldn’t resist a selfie.) 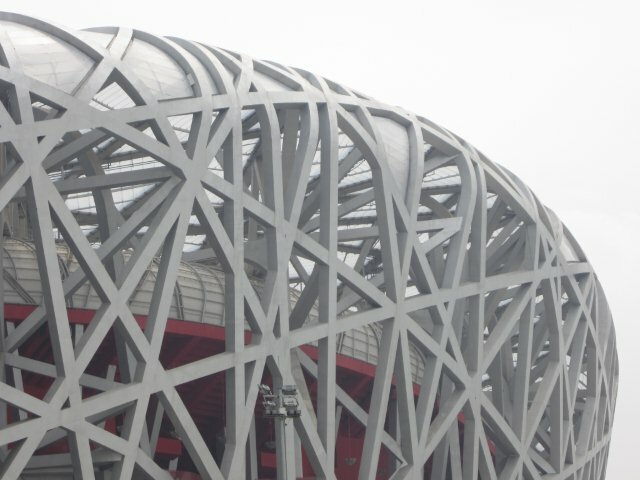 The Bird’s Nest cost nearly half a billion dollars to construct and costs an additional $11 million to maintain each year. Yet since the Olympics ended it’s gotten very little use. There are only so many things to be done in a building this size. 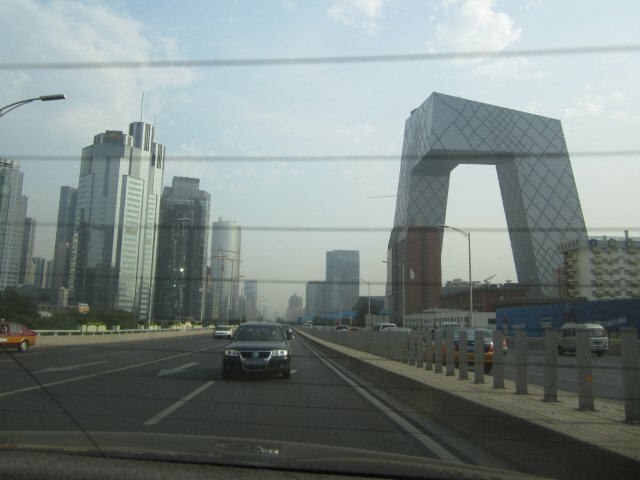 It’s essentially a giant 91,000 seat monument to the power and wealth of the Chinese nation. Unfortunately the longer it sits empty the shabbier it looks and the more it reads as a spendthrift’s monument to vanity. Next Next post: What Are You Willing to Compromise for Location?